Carbon dioxide emissions from electric power plants have fallen to their lowest level in decades, and that trend could help states meet their emissions goals under the Obama administration’s Clean Power Plan if it survives court challenges, according to new U.S. Energy Information Administration data and a New York University analysis. Carbon dioxide emissions from generating electricity in 2015 were 21 percent below 2005 levels in the U.S. The goal of the Clean Power Plan is to cut emissions by 32 percent below 2005 levels by 2030, mainly from coal-fired power plants. In raw numbers, generating electricity in the U.S. was the source of 1.9 billion metric tons of carbon dioxide emissions in 2015 — roughly the same as in 1993. Emissions peaked in 2007, when the country’s power plants emitted 2.4 billion metric tons of carbon dioxide. By 2014, power plant emissions had dropped to about 2.05 billion metric tons. Coal use is the largest single contributor to emissions causing climate change. The Clean Power Plan, which the U.S. Supreme Court has put on hold while legal challenges have their day in court, was critical to establishing U.S. credibility during the Paris climate talks last year. States have until September 2018 to decide how to cut emissions under the plan. The electric power sector’s carbon emissions are falling for several reasons. Warmer winters in the U.S., influenced by global warming, have reduced the need for people to heat their homes, driving down electric power demand in the winter months, according to the EIA. There is also a basic shift in how electricity is generated — from coal to natural gas and renewables, EIA analyst Channele Wirman said. Low natural gas prices have encouraged utilities to shutter coal-fired power plants and build new ones that run on natural gas, which emit roughly half the carbon dioxide as those that use coal. Wind, solar and other renewables helped to cut emissions even more. A decade ago, 8 percent of U.S. electricity came from renewables. Last year, they were the source of 13 percent of the country’s electricity. 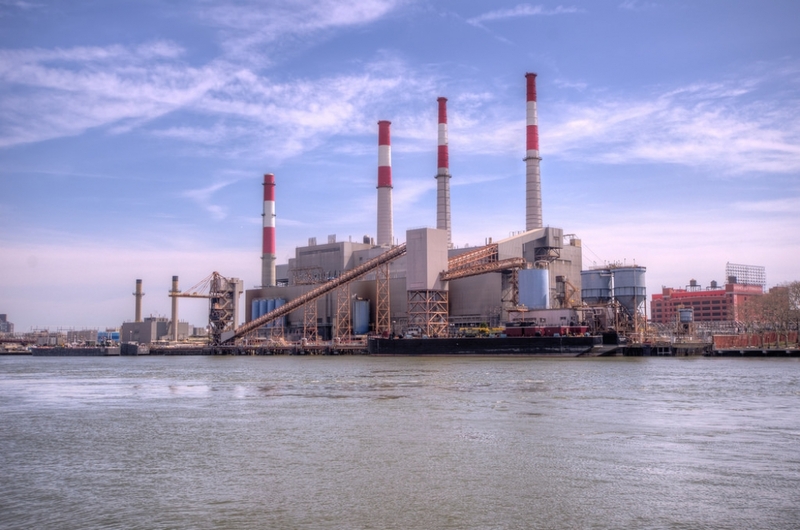 A power plant in New York City. All of that adds up to two things: cleaner air and more climate-friendly electricity. “Even without the Clean Power Plan in effect, market factors like the low price of natural gas and the declining cost of renewable generation technologies are pushing states toward a cleaner energy mix,” Jack Lienke, senior attorney at NYU’s Institute for Policy Integrity, said. For example, natural gas is expected to overtake coal this year as the nation’s chief source of electricity, a tax credit is expected to fuel widespread wind and solar power expansion over the next decade and the declining economics of coal are spurring a move toward cleaner energy, according to the institute’s analysis. The trend toward low-carbon electricity means that states will have a leg up in meeting the Clean Power Plan’s goals even if the plan itself is delayed by the courts. But there is no guarantee the economics pointing to long-term growth in clean energy will be continue for a long time, and the if the Clean Power Plan survives court challenges, it will help provide certainty for electric power companies if the economic winds change quickly, Lienke said. “That certainty is helpful to companies and states making long-term investments in clean energy, and it’s helpful to the U.S. in international climate negotiations,” he said.